What is arguably the city's most up and coming area for live music and art in Toronto is under threat of disappearing before getting a chance to really bloom. Geary Avenue is home to a variety of music, event, and rehearsal spaces including DIY initiatives, perhaps most notably Geary Lane, a warehouse turned rehearsal space turned music venue at the west-most end of the street. Geary Lane opened just one year ago, but quickly established itself as one of Toronto's most exciting live music venues - and helped propel some, rather misguidedly, to call Geary "the next Ossington." The street has been thrust under the spotlight, but perhaps all that attention wasn't a good thing for the music community. On March 17, Municipal Licensing and Standards Officers were dispatched to Geary Avenue to check up on zoning issues related to these spaces. 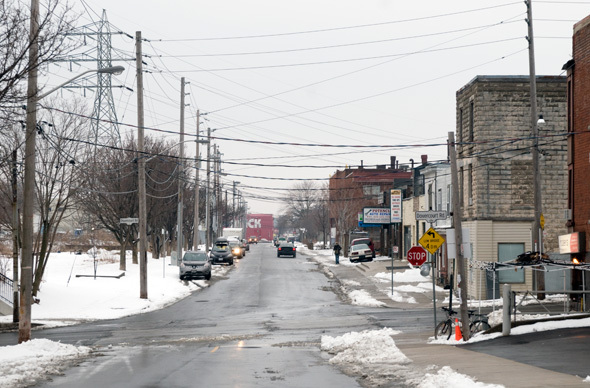 "The City received a number of noise complaints in respect to different properties on Geary Avenue," explains Tammy Robbinson of the City of Toronto. "The bylaw infraction notices were issued for zoning. The area is zoned for "Performing Arts Studios" which include show rehearsals, dancing and theatre." Geary Ave is presently zoned as an E2 Employment Industrial Zone, which does not permit "nightclubs" or "entertainment facilities." In other words, live music is technically not allowed on the street under the city's bylaw system. Officers stopped by venues as well as practice spaces like Geary's Rehearsal Factory, though only the venues were cited. In a post on Facebook today, Geary Lane booker Jason Pollard writes, "this is a very bittersweet day for me, as I bring the news that Geary Lane has been temporarily shuttered due to some inevitable red tape that has come up with the city of Toronto." Pollard has just announced Toronto's newest music festival, Sound SĂŠance, in association with Montreal's Suoni Per Il Popolo, which was originally slated for Geary Lane, but may now be forced to relocate. "Due to the current bylaw issues at the original home venue of Geary Lane, I have been forced to move the festival, which initially had outdoor components, off site while the issues are worked out with the city." "There is a possibility these shows could still happen at Geary Lane if the red tape is cleared up on time," Pollard tells us. But in the meantime he's reached out to other venues to cover his bases. Another would-be Toronto venue impacted by the zoning issues is ex-Saving Gigi and the Bloor Ossington Folk Festival's new project on Geary, Mercury Social Club. On April 2nd, the co-owners posted an message on their Facebook page updating the community on setbacks they've experienced on the street. It appears convoluted zoning issues may prevent them from bringing many of their exciting dream concepts to Geary, including hosting live music once they open. These issues strike at an interesting time for the city's music scene, as the recently launched Music City initiative and Austin Alliance recently compelled Mayor John Tory to comment on Toronto's need to cut red tape for the city's music industry after visiting SXSW for the first time. While the situation on Geary only involves a handful of venues, it wouldn't be an exaggeration to say that this could be the first a watershed moment for Toronto's stated commitment to brand itself as a music industry leader. These venues, while not zoned correctly, have filled a gap in the city many have decried for a long time: DIY spaces for emerging artists and music, and all ages events. Spaces like this are incubators for talent, and Toronto's recently appointed first ever Music Sector Development Officer Mike Tanner says the city is beginning to understand that priorities don't only lie with big business, but with grassroots organizations like DIY venues, which often lay the invisible foundations of a resilient and diverse music community. "[City reports] talk about neighbourhoods... about about how music informs a community... There is an understanding in the city that music is a very important thing, like recreation and other ways in which people connect with their own culture and who they are," Tanner explains. "It's not just about numbers, data, or dollars you're generating - there is a recognition in the city, and there always has been, that music is a hugely important part of our social fabric." Tanner is working with Pollard and other representatives from both the City and Geary Ave to try to address the problem - both in the long term, in light of antiquated zoning, and in the short term, in the interest of getting Geary Lane back in business in time for the Sound Seance Festival. Pollard's Facebook post emphasizes the need for Toronto music fans to use the momentum of City Hall's new promises to the music community to help keep the street from going quiet. "Toronto needs to loosen the red tape surrounding spaces like ours that do nothing but promote growth in the art world and foster the young, super talented musicians this city continuously produces. In short, without DIY spaces like Geary and many others that are struggling to get by, our city becomes a cold, grey place, devoid of cultural identity." Pollard also encourages music fans to attend the upcoming Toronto Music City Town Hall Meeting April 25th at the Garrison, where Mike Tanner and other city officials will be in attendance - "in large part, just to listen." Will the City's vision for Toronto's music scene match up with those building its foundations?